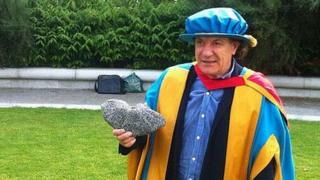 AC/DC singer Brian Johnson has received an honorary degree from Northumbria University. The 67-year-old, who was born in Dunston, Gateshead, was awarded an honorary Doctor of Music for his "inspirational" achievements. He began singing in a church choir in Gateshead, before making his name with Tyneside band Geordie in the 1970s. He joined Australian-based rockers AC/DC in 1980 after the death of the band's original singer Bon Scott. Mr Johnson said: "When you move away from here and you come back, you suddenly realise what you had... it's wonderful to be back. "I hate to use the word humbling but it really does slap you down a couple of notches." AC/DC remains one of the world's most successful rock bands, having sold an estimated 150 million albums. The group's recent Black Ice tour was the fourth biggest-grossing of all-time, making about £258m ($440m). AC/DC formed in Australia in 1973 and their biggest-selling record was 1980's Back In Black - the first to feature Mr Johnson. Prof Andrew Wathey, vice-chancellor and chief executive of the university, said: "It is fitting that we honour one of the most distinctive voices in rock music, who is also a native of the North East. "It is interesting to reflect on the importance of culture to collective life of the North East and of the cultural industries as a major UK export. "Brian Johnson symbolises both of these things and, moreover, has been an inspiration to generations of young musicians over several decades."